Nov. 5: Rosenthal will also receive a $1MM assignment bonus each time that is traded over the life of the contract, Heyman tweets. Nov. 3, 9:40am: The deal is now official, per the team (via Twitter). Rosenthal signs a one-year deal with a conditional option for a second season, tweets the Washington Post’s Jesse Dougherty, among others. 12:58pm: Unsurprisingly, Joel Sherman of the New York Post tweets, it’ll be a MLB deal that’s structured similarly to the contract that Greg Holland signed with the Rockies for the 2016 campaign. Holland, another Boras client and former closer who was returning from Tommy John surgery on a similar timeline, received a $7MM guarantee in his deal, which also included a hefty incentives package and vesting player option. In this case, Rosenthal will also be promised $7MM, which includes a buyout on the 2020 option. He can earn up to $14MM in salary for the 2019 campaign, through operation of incentives, and the deal includes a vesting player option that will seemingly be valued at $15MM. Sherman (via Twitter), Jon Heyman of Fancred (Twitter links), and Jeff Passan of Yahoo Sports (Twitter link) covered the details. Of course, it’s relatively rare in these cases that the second season makes sense for both sides. If Rosenthal throws well enough to trigger the player option, he could well end up deciding to test the open market, though that might also mean he’d draw a qualifying offer from the Nats. In any event, those possibilities will certainly depend upon his performance in the season to come. 12:00pm: The Nationals are “finalizing” a contract with free agent right-hander Trevor Rosenthal, according to Bob Nightengale of USA Today (Twitter link). Terms of the prospective agreement are not yet known. Rosenthal, a client of the Boras Corporation, recently put on a showcase to exhibit his form after rehabbing from Tommy John surgery. Evidently, he impressed the Washington brass, who’ll take a shot on the hard-throwing former Cardinals late-inning standby. While it’s not yet clear just what role will be given to Rosenthal, who’s still just 28 years of age, the report suggests he’ll “anchor the bullpen.” Though southpaw Sean Doolittle figures to have the inside track on the ninth inning, given his outstanding (albeit injury-shortened) 2018 showing, the Nats could certainly use Rosenthal as their top set-up option or perhaps get more creative in their pen usage based upon situations. The chance at high-leverage innings seems to have been a motivating factor for Rosenthal, who said as much in an interesting recent chat with Rob Rains of STLSportsPage.com. Rosenthal also held true to his stated desire to put pen to paper before the start of November. Rosenthal’s TJ procedure took place in late August of 2017, so he is now already about 14 months out from the operating table. There’s every reason to think that he’ll be a full go for Spring Training, particularly since he has already shown that he’s capable of working in his customary upper-nineties velocity. Of course, the real question with Rosenthal has never been one of arm strength. He has at times dealt with control issues, dishing out 5.4 walks per nine in the 2014 season and a hefty 6.5 free passes per nine in 2016. That latter campaign was a rough one for the flamethrower: he also surrendered a whopping .425 BABIP, lost his closing job, and ended the season with a 4.46 ERA. In camp in 2017, Rosenthal dabbled with a return to a starting role — he functioned in that capacity in the minors, but never in the bigs — but ultimately returned to the St. Louis relief corps. Before going down to a torn UCL, Rosenthal threw 47 2/3 innings of 3.40 ERA ball with a career-high 14.3 K/9 against 3.8 BB/9. Rosenthal carried a personal-high 15.9% swinging-strike rate for the season, finding an extra gear as he completely abandoned his curve in favor of his slider. For the Nats, the move represents the second interesting relief addition of the still-early offseason. Previously, the club added Kyle Barracough via trade. These two righties both come with their share of uncertainty, but will unquestionably add a ton of velocity to the Washington pen. After reporting this morning that the Marlins had agreed to a deal with right-hander Trevor Rosenthal, Bob Nightengale of USA Today reversed his initial report upon being informed by agent Scott Boras that no deal was in place. (Twitter links.) Indeed, to the contrary, Boras says that Rosenthal does not plan to sign a contract at all for the coming season. It seems that Rosenthal, who is recovering from Tommy John surgery, had been weighing an offer from Miami that would have allowed him to complete his rehab and potentially return later in the 2018 season. Per the initial report, Rosenthal would have earned at the league-minimum rate in both the minors and majors for any active time in the current season. Importantly, it was unclear whether the prospective contract was a minor-league deal or a split major-league deal. In the latter situation, presumably, Rosenthal would have earned MLB service time while on the disabled list. Whatever the case, Brian Stull of St. Louis Baseball Weekly reported (Twitter link) that the Cardinals made a “similar offer,” so there were evidently multiple teams in pursuit. Instead, Rosenthal expects to complete his rehab and showcase for the teams in the 2018-19 offseason. It seems, then, that he’ll follow the course taken previously by Greg Holland, another Boras client. Holland underwent Tommy John surgery late in the 2015 season, much as Rosenthal did a year ago. He ended up waiting until early in 2017 to sign a deal that allowed him to earn good money for the coming season and then return to the open market thereafter. There were, of course, alternatives. Many recovering TJ patients have found guaranteed money on the open market. Drew Smyly and Michael Pineda recently took down $10MM guarantees on two-year deals, despite the expectation that both will miss most or all of the 2018 campaign. Nathan Eovaldi was promised $4MM in the prior offseason. Relievers have similarly inked two-year arrangements in prior years, with Luke Hochevar and Eric O’Flaherty representing examples (though in both cases, their rehab timelines led to expectations of significant availability in the first season of the contract). When the now-discarded report came through this morning, though, it seemed that there were two other possibilities. Because Rosenthal currently has just over five years of MLB service, he’d remain eligible for arbitration in 2019 even if he returned late in the season. Had he joined the Miami organization on a minors pact, then, the club would effectively have picked up an option. Rosenthal had projected to earn $7.9MM in his final season of eligibility, which isn’t exactly cheap but would also be quite an appealing price tag if he can regain his former form. Of course, Boras no doubt anticipates there could be quite a bit more earning power for a pitcher who is still just 27 years of age. Thus, it seemed possible that Rosenthal could have inked a split MLB contract. In that case, he’d have gone onto the major-league DL, where he could have accrued enough service time to qualify for free agency at the end of the campaign while also having a shot at showcasing at the MLB level late in 2018. Only the possibility of a qualifying offer — unlikely, perhaps, to be issued by a budget-conscious Marlins organization — would have clouded Rosenthal’s future open-market status. Whether or not such an arrangement would have passed muster with league and union officials, perhaps, is an open (and thus-far hypothetical) question. In any event, that’s all academic at this point. 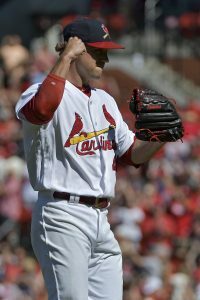 It now seems Rosenthal will work back to full strength before he goes after his next contract. Given his age and track record, it’s conceivable that he could end up even seeking a longer-term deal than the one Holland initially signed with the Rockies. There certainly seems to be reason to hope that Rosenthal can again be a premium relief asset. Long a quality late-inning arm, he struggled quite a bit in 2016 but bounced back last season. In his 47 2/3 innings in 2017, Rosenthal pitched to a 3.40 ERA with a career-high 14.3 K/9 against 3.8 BB/9. He worked at 98.8 with his average heater and generated a 15.9% swinging-strike rate — both also personal bests, the latter by quite a significant margin over his career average. The Cardinals have granted right-hander Trevor Rosenthal his unconditional release, per MLB.com’s Jenifer Langosch (on Twitter). Rosenthal was eligible for arbitration this offseason but underwent Tommy John surgery this summer and is likely to miss the majority, if not all of the 2018 season as a result. The 27-year-old Rosenthal went under the knife late in August, making it unlikely that he’ll be able to contribute next season. Even in the unlikely event that Rosenthal had made it back for the tail end of the 2018 season, MLBTR contributor Matt Swartz had projected a $7.9MM salary, which would be far more than any club would be willing to pay given the amount of the season he’ll miss. Rosenthal and agent Scott Boras will have to weigh multiple options this winter in free agency. When faced with a similar situation, Boras and client Greg Holland opted not to sign at all in the 2015-16 offseason, instead waiting until Holland was completely healed in the 2016-17 offseason and signing a one-year deal with a player option. That route certainly comes with more earning power, though all players have different preferences. Alternatively, Rosenthal may well wish to find the security that someone like Nathan Eovaldi received last offseason, signing a one-year MLB deal with the Rays that contained a cheap club option for the 2018 campaign. While Eovaldi will “only” earn about $4MM over the 2017-18 seasons, he’s now had a full year to familiarize himself with his new organization and locked in some guaranteed money in the process. Rosenthal could go either route, though the Holland route leaves him exposed to the possibility of lingering complications from his surgery ultimately preventing him from coming away from the ordeal with any guaranteed money. Regardless, interest in Rosenthal this winter should be robust, as teams look to buy low on the possibility of adding a high-caliber arm to their bullpen for the 2019 campaign once he has (hopefully) recovered from the ligament replacement procedure. The Cardinals announced earlier today that Trevor Rosenthal has been placed on the 60-day disabled list, and a followup announcement out of St. Louis confirms what many Cardinals fans had feared; general manager Mike Girsch confirmed to reporters that Rosenthal has suffered a tear of the ulnar collateral ligament in his right elbow and will undergo Tommy John surgery next week (Twitter link via Ben Frederickson of the St. Louis Post-Dispatch). Rosenthal’s placement on the 60-day DL already ended his season — a critical blow to a team that is still in the mix for both a division title and an NL Wild Card spot — but the prognosis of a torn UCL may now also spell the end of his time as a member of the Cardinals organization entirely. Rosenthal will almost certainly miss all of the 2018 campaign, and even if the Cardinals hold out faint hope that he can return for the final month next year, he’ll still be non-tendered rather than given a raise on this year’s $6.4MM salary. The 27-year-old Rosenthal struggled through a down year in 2016 but was tendered a contract for the 2017 campaign anyhow, and he’d largely righted the ship this year. While he had a rocky stretch in mid-to-late June, Rosenthal had burst out of the gates in the season’s second half, firing 14 1/3 innings with just three earned runs allowed and a scintillating 23-to-4 K/BB ratio. Of those three earned runs he surrendered, two came in his final outing of the year (and possibly his final appearance as a Cardinal); Rosenthal allowed a leadoff homer to Xander Bogaerts and walked Mitch Moreland before being pulled from the game. Rosenthal’s agent, Scott Boras, will now find himself in a similar position to the one he faced with Greg Holland two years ago. Like Holland, Rosenthal is a well-regarded high-leverage reliever that will undergo Tommy John surgery late in the regular season. (Holland’s surgery was performed at the end of September in 2015.) Rosenthal and Boras could seek some kind of backloaded two-year contract this winter, which would allow the righty to rehab with a new organization before hopefully being healthy enough to take the field in 2019. Alternatively, Rosenthal could opt not to sign a contract at all this winter. That’s the route that Holland took following his own Tommy John procedure, as he opted not to sign in the 2015-16 winter before hosting multiple showcases/workouts for interested teams when he was back to full strength in the 2016-17 offseason. The Cardinals have moved righty Trevor Rosenthal from the 10-day to the 60-day DL, per a club announcement. That move brings his season to an end, though a course of treatment for his elbow injury has yet to be disclosed. With Rosenthal hitting the shelf for good, it seems Seung-hwan Oh is the odds-on favorite to function as the St. Louis closer the rest of the way. St. Louis has purchased the contract of southpaw Ryan Sherriff, necessitating the 40-man roster move. The club optioned righty Josh Lucas to clear active roster space. While his fate this year has now been resolved, Rosenthal’s future remains up in the air. It is not yet entirely clear just what elbow injury he has suffered, though indications are that ligament damage is involved. Should Rosenthal require a significant procedure, such as Tommy John surgery, he might be sidelined long enough that the Cardinals would elect not to tender him a contract for his final year of arbitration eligibility. But the team could still keep him around — with a raise over his $6.4MM salary — if Rosenthal is instead able to rehab or escape with a less significant surgical approach. Regardless, today’s news is quite disappointing for both the team and a player who had shown a return to form in 2017. The 27-year-old surrendered 6.5 walks and 4.46 earned runs per nine innings in a disappointing 2016 campaign that was further marred by questions about his arm health. He came into camp this year having lost his closer role, seeking instead to work as a starter. As it turned out, Rosenthal ended up working back into the ninth for St. Louis, ultimately saving 11 games before hitting the DL. He carried a 3.40 ERA through 47 2/3 innings, tamping down on the free passes (3.8 BB/9) while sporting career-highs in strikeout rate (14.3 K/9), swinging-strike rate (15.9%), and average fastball velocity (98.9 mph). No matter how things proceed from here, Rosenthal will surely be looked upon as one of the game’s most intriguing bounceback candidates given his age and demonstrated ceiling. Whether that effort will come with the Cards or another organization, though, remains to be seen.